Christmas should be a happy time and writing profiles on this web site should be doing no more than remembering a particular player's time at Burnley and his contribution to our club. Today however, on Christmas Eve, news reached us that our former captain Ray Deakin had passed away following a fight against illness over the past four to five months. It is over 23 years since he first walked into Turf Moor. We'd just been relegated and were facing our first ever season in the Fourth Division. We had a new manager in Martin Buchan and his second signing was Ray Deakin as we looked to make an immediate return to Division Three. The Liverpool born defender had started his career with Everton after representing England at schoolboy level. After serving his apprenticeship from 1975 to 1977 he signed his first professional deal, but in four years as a pro at Goodison Park he didn't make the first team and in the summer of 1981 he moved to Port Vale. It was in August 1981, by now aged 22, that he finally made his Football League debut in a Fourth Division game against Halifax at Vale Park. He was at left back then and in his first five games for Vale he scored three times, although all three were from the penalty spot. He was in and out of the Vale side during that season and in the summer of 1982 he moved again, this time signing for John McGovern at Bolton. He spent three years at Burnden Park and was a first team regular throughout his time there. He was still at left back when he moved to Bolton but during those three years he settled into a place in the centre of defence. 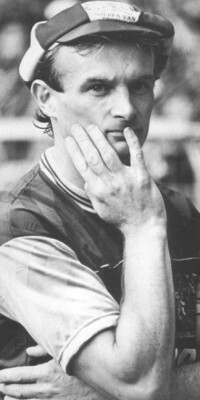 When he moved from Bolton to Burnley in 1985 he made his league debut for the Clarets in a 3-2 win against Northampton on the opening day of the season in a side that lined up: Joe Neenan, Geoff Palmer, Jim Heggarty, Vince Overson, Ray Deakin, Peter Hampton, Kevin Hird, Phil Malley, Alan Taylor, Wayne Biggins, Neil Grewcock. He was an ever present in each of his first two seasons, mainly playing in the centre of defence, and in 1986/87 he took over as captain from Overson who had moved on to Birmingham City. Accepting the captaincy meant that he led the team out at the end of that season in what proved to be the club's most important game ever against Orient, a game we simply had to win to have any chance of staying in the league. We did win it, and Deakin was one of the players that Brian Miller rebuilt his side with. Such is football that just one year on from that most crucial of games he was again leading Burnley out on a big occasion. This time it was a joyous one at Wembley for the Sherpa Van Trophy Final and he joined Alan Brown and Jimmy Adamson as the Burnley captains to have led a team out there. The game was lost 2-0, and for Deakin the following season was not his best as he suffered injury for much of it and played less than a third of the games. When he returned he found himself back in the left back position for much of the next two seasons that proved to be his last in the game. We reached the play offs at the end of the 1990/91 season and Ray played in the first leg of the semi-final at Plainmoor against Torquay. He was left out for the second leg and was released at the end of the season after six years with the Clarets. That Torquay game proved to be his last. He played 271 times for us during his six years at Turf Moor and when he left he called time on his football career. His career at Burnley hadn't just been about playing football either. As part of a PFA initiative he did a course and earned himself a PSV licence. There weren't many club captains that doubled up as the coach driver, but he was often seen at the wheel as the team arrived for an away game. Ray Deakin will forever be known to Burnley fans as 'Whoooooshy'. It was a nickname that came about when he played at full back and for a while had a habit of slicing his clearances out of play. Every time the cry of 'whooooosh' could be heard from the Longside. But he was a favourite at the time, and I think Burnley fans around in 1987 are fully aware how important he was to that side. Without doubt one of the key players in the side that just managed to hang on to Football League status. Out of football, his name hadn't been heard for some time. That was until August 2008. With the Football League season about to start the news reached us that he had a brain tumour that had been partially removed. He was hopeful, but there was to be a set back in October when he suffered a stroke. That ultimately led to his sad and untimely death on Christmas Eve 2008 at the age of just 49. Burnley Football Club announced there would be a minute's applause before the Boxing Day home game against Barnsley. The tributes poured into Clarets Mad via the message board and it was so very clear that Ray Deakin was held in great affection by so many Burnley supporters.